What did Bell eat in the desert? Gertrude Bell certainly wasn’t inflexibly wedded to British food and she understood the importance of fuelling one’s body for strenuous travels and explorations, so she would eat what was locally available when circumstances required. There was the occasional upturned nose, it appears from her writings, where the local food was considered a challenge to the palate - she was somewhat startled by pineapple served with salt when touring in the Dutch Far East, for example - but she politely ate what was going when she was hungry. Bell would sometimes mention in her letters the concoctions that her manservant Fattuh had prepared for her, in his efforts to use the available local ingredients whilst maintaining a British or at least a European feel to the dinner. On one occasion travelling in the Turkish interior near the Syrian border, she was outwitted by his deadpan humour. Wishing to develop her Arabic, asked Fattuh what the small lamb sausages he’d made were called. His reply was pretty much, ‘sausages, ma’am’. Long days and weeks in the saddle in the Middle East inevitably meant that water and perishable foods were sourced locally, as the caravan progressed on its journey. Anyone who had done archaeological fieldwork in the region will be familiar with the foods available to Bell: different types of breads, eggs, leben and sour curds (yogurts), milk, cheeses, salad vegetables, fresh fruit and flat-leafed herbs like parsley and coriander, are sourced locally. Vegetables that can last on the road for a few days or weeks include squashes, aubergines, onions and carrots; and dried fruits are popular and abundant. Pulses and grains too are plentiful; and other stable staples include salt, spices and dried herbs. Servants like Fattuh who travelled with GertrudeBell extensively, and Hannah who was with her in the Levant, would often obtain meat as part of dinner, normally mutton or lamb. Typical meals during her travels in Syria, Palestine, Lebanon and Jordan included flat-breads (eg pitta), lentils, rice, vegetables and lamb slices or chops, served with yogurt, eggs, cheeses, tea and coffee. We drank tea and coffee and had a dinner of meat, rice, leban and thin flaps of bread. By 6.30 I was back in my tent. The weather is settling’ (Diary, 10th Feb 1905. Near Madaba, Jordan). ‘We came down into a troglodyte Yezidi village where the people gave us bread and sour curds and were very anxious, when they heard I had visited Ali Beg, to kill a sheep for me’’ (Letter to Florence Bell, 20th May 1909). Her meeting with Ali Beg, the high priest of the Yazidis, had occurred two weeks earlier and had been an intricate dance of diplomacy, social conversation, and food. Bell was the foreigner here, yet she wrote about Ali Beg as if he were the outsider, a narrative possibly exaggerated in that it was told mostly in a letter to her step-mother. The redoubtable Florence Bell, as well as being a lady and mother, was also an author and playwright fascinated with the working class, the implementation of manners, and what might be termed ‘otherness’. Gertrude as a consequence often seems to ramp up the stories she told to Florence for maximum effect. This letter makes mention that hospitality in the form of accommodation was cunningly declined because of fleas; but reveals how Bell accepted a great deal of food from Ali Beg, while not feeling quite the same obligations toward Ali Beg’s sister despite her high status. Bell, herself the foreigner, saw the Yazidis as different, and foreigners in a foreign land; and the women as being exotic and more different still. While this contrasts with how she describes her perceptions of other British women in the Middle East, who might variously be ‘nice little wives’ or ‘quite intelligent’, a common theme is that Bell is her own yardstick for judging other women while carrying an internalised identity as ‘exceptional’. Tangled up in difference, her own and others’, her life frequently veered from locked horns and frustrations to transient pleasures. There are times when it seems that Bell made no bones about signalling her exceptionalism to her family. During the same excursion of 1909, while exploring and surveying a remote rock-cut monastery, she was very unusually served a meal by the prior. There are 10 monks who live in caves hollowed out of the rock; they eat nothing but bread and lentils and oil and some may see no women, so that they had to lock themselves up in their caves while I was planning the church. The prior made a special exception for me (since, as he explained, very few travellers came that way); not only did he show me all over the monastery and climb with me into the cave-cell of St Eugenius, but he prepared me a lunch of omelet, lentils and raisins (the monastery kitchen is a big cave) and served it for me in his own cell, which is also a cave (Letter to Florence Bell, 20th May 1909). I have wondered if Bell overstated the frugality of her meal. It’s unlikely that she was literally served a plain omelette, lentils and some raisins, especially as the Prior was the master of his own cave kitchen and was probably used to one-pot cooking. It’s possible that she was presented with a dish akin to a Middle Eastern ‘Persian eggs with lentils and raisins’, where cooked lentils are mixed in a pan with rice, raisins and other ingredients such as onions and tomatoes, to which spices and herbs are added. Eggs are cracked on top to cook (sometimes broken and ‘omeletted’, sometimes baked under a lid) towards the end of cooking. It tastes amazing. When Gertrude Bell made her epic journey through Saudi Arabia in the winter and early spring of 1913-1914, prior to the outbreak of WW1, she wasn’t quite the ‘lone European woman traveller’ that some hagiographers have chosen to portray. She was certainly the only woman and the only European in her party, but she was far from alone. 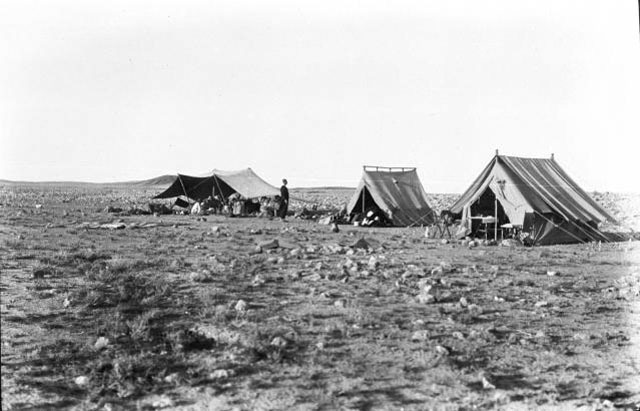 The photographs that she took herself of her encampments and the camels being watered reveal a decent-sized caravan, carrying her sleeping tent, dining and cooking equipment, provisions, and her portable bath. Bell herself was athletic, lean of frame, and a heavy smoker, and probably didn’t eat a great deal - her idea of ‘getting fatter‘ was eating too many sour curds (cottage cheese) in Damascus before she set off into the interior of Saudi Arabia and the oasis town of Hayyil. Sour curds were, she wrote to her step-mother, ‘without doubt the best food in the world’ (Letter 5th December 1913). However Bell had men and seventeen camels to feed and water, and the acquisition of food took up a great part of the mental load or organising and undertaking her expedition of 1913-14. As well as letters of introduction to the various desert tribes, there were other important factors to take of, such as securing word-of-mouth contacts through hiring and meeting the right men at various stages of the journey, carrying hard cash money, speaking the right language(s), and gift-giving. It was a very expensive expedition. The start of the journey had been delayed in Damascus owing to Fattuh’s falling ill - with either malaria or typhoid - but eventually in mid-December they were on their way, Bell hoping that Fattuh might join them later when recovered. She wrote that his temporary replacement did not even know how to boil an egg. Four days into their journey, their provisions were still well-stocked. There were privations, however, notably the extreme cold and the frosts that the caravan endured over what at home was the Christmas period. Their fortunes turned a few days later when an Arab tribal chief shaikh [sic] killed a sheep in their honour (Letter to Hugh and Florence Bell, 28th December 1913). Gertrude Bell accepted and reciprocated the honour in the expected fashion, giving him the gift of a cloak in return. A ‘washed out European’ she may well have felt at that time; but nevertheless, she brought colour and vibrancy to much of what she did, and the legacy of her copious letters and her diaries means that writers like me can study her life and times. While Gertrude Bell herself does not focus a great deal on food and eating in her letters and diaries, she writes enough for us to glean the social purposes that food preparation, food consumption and food security served in her world as both Victorian-born woman and the journeying Arabist. The sharing of food and acts of eating are often described as a social glue; and the preparation of food can be a complex task which, along with cultural attitudes toward food and social eating, can be layered with symbolic meanings. Knowledge of food and the location of sources of food and water describe and define cultural and physical landscapes. For all the ‘glue’, access to that knowledge and the locations of food is hugely hierarchical in human societies. Bell’s reliance on others for knowledge of desert resources, her dependence on servants for food preparations, her acceptance of offers of hospitality from some while dissembling to others, acts as a parable of her machinations in a foreign land and how she saw the ‘natural order of things’. Furthermore, we all perform roles, and we use material culture (things) with which to enact the performance. Bell, however, presents conundrums, and is not easily pigeon-holed. In employing the accoutrements of ‘civilised’ British living, was Bell performing eccentricity or elitism, individuality or colonialism, female independence or paternalistic over-lordship? Was she really a rebel, or was she a privileged British woman in the desert with a dining service and a pop-up bath? Or was she both, simultaneously - imperiously, imperially unique, yet a persona who wove herself inexorably into the tapestry of the post-Victorian British adventure in the Middle East. Acknowledgments The Gertrude Bell Archive, Newcastle University; Stephen Hill et al 1985 Catalogue of the Gertrude Bell Photographic Archive (Dept of Archaeology, Newcastle University); The Scotsman 30th March 2003 https://www.scotsman.com/lifestyle/queen-of-the-desert-1-1383828; David Whetstone 28th August 2014 The Journal http://www.thejournal.co.uk/north-east-analysis/analysis-news/memories-gertrude-bell-stirred-troubles-7671670; Mike Parker Pearson 1999 The Archaeology of Death and Burial (Sutton).